You are here: Home › Further Reading › JFK Assassination FAQs › How Accurate is Oliver Stone’s Film, JFK ? How Accurate is Oliver Stone’s JFK? Oliver Stone treated the main questions accurately: where Oswald was during the shooting, the single bullet theory, connections between Oswald and US intelligence, and the purpose of the Warren Commission. Its inclusion of the Zapruder film, which depicts with great clarity a large part of the shooting sequence, and in particular the fatal head shot. Its use of the iconic phrase “back and to the left” to describe the movement of President Kennedy’s head in reaction to the fatal shot. The enormous amount of hostility directed at the film by pundits in the print and broadcast media. As far as I know, JFK is the only movie in film history that was attacked, six months before it was released, in just about every major broadcast and print outlet. The media’s hostility to Oliver Stone’s JFK was an automatic response to the film’s implied questioning of the legitimacy of certain national institutions. For an account of the reaction to the film, see Fiction, Propaganda and the Media. Although the purpose of the attacks was simply to maintain adequate public support for institutional power, the form the attacks took was to claim that the film contained serious historical inaccuracies. Some of those criticisms were valid; others were either exaggerated or mistaken. The JFK assassination is full of ambiguous and disputed evidence, much of which is neither here nor there. For example, Lee Harvey Oswald was accused of attempting to murder General Edwin Walker. He may or may not have done so; there is no definitive evidence either way. But if he did shoot at Walker, that does not prove that he shot at Kennedy; and if he did not shoot at Walker, that does not prove that he did not shoot at Kennedy. Many of the accusations against JFK were directed at this type of issue. Because the film concentrates on Jim Garrison’s investigation of the New Orleans aspects of the crime, a good deal of the film’s material falls into this category. Some of the accusations turned out to be accurate, and pointed to factual errors in the film. Some referred to evidence that could reasonably be interpreted in more than one way. Other accusations were not accurate; in some of these cases, what were alleged to be errors were merely examples of dramatic licence. The next article, Are There Factual Errors in Oliver Stone’s JFK ?, will examine a representative sample of these criticisms. The important question, which will be dealt with first, is: how does the film deal with the central issues in the assassination of President Kennedy? Few critics suggested that there were any serious problems with Stone’s treatment of the main issues of the JFK assassination. Some veterans of the Warren Commission, in particular David Belin and Gerald Ford, objected more strongly to the fact that JFK dared to question the Warren Report than to the actual questions that the film raised. Where was Oswald when President Kennedy was shot? Were there shots from more than one direction? Could the assassination have been performed by just one gunman? How plausible is the single–bullet theory? Was Oswald connected to any intelligence organisations? How significant was the impersonation of Oswald in Mexico City and Dallas? What was the purpose of the Warren Commission? 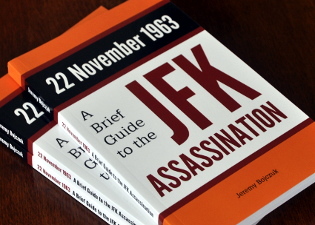 When a scene is identified in the following text, a reference is given to the page number in the version of the screenplay included in Oliver Stone and Zachary Sklar, JFK: The Book of the Film , Applause Books, 1992. Because several versions of the film exist, it is not feasible to identify scenes by timings. As a very rough guide, one page of script corresponds to one minute of film. Stone and Sklar’s book contains many examples of the criticism directed at the film. Where Was Oswald During the Assassination? JFK deals briefly but effectively with the fundamental question of Oswald’s location during the assassination. If Oswald had played any part in the shooting, he must have been on the sixth floor of the Texas School Book Depository, where the rifle and bullet shells were found. Because Oswald would have needed to put his rifle together and construct a shield of book cartons around the south–east corner window, he must have been on the sixth floor for some time before 12:30pm, as the Warren Report pointed out (see the Basic Facts of the JFK Assassination). He mentions two eye–witnesses, Eddie Piper and William Shelley, who saw Oswald on the first (ground) floor at mid–day, when, according to the Warren Report , Oswald was assembling his rifle and sniper’s nest on the sixth floor (p.167; Piper: Warren Commission Hearings , vol.19, p.499; Shelley: Warren Commission Hearings , vol.6, p.328). Garrison mentions the evidence of Bonnie Ray Williams, who said that he had been alone on the sixth floor shortly after mid–day, when Oswald was supposed to have been there (p.168; Williams: Warren Commission Hearings , vol.3, pp.169–170). The film uses the words of Carolyn Arnold (played by Carol Farabee), from a later newspaper interview, to emphasise that she saw Oswald in the second–floor canteen at around 12:15 (p.169). Garrison mentions Arnold Rowland, a spectator in Dealey Plaza, who saw a gunman on the sixth floor at the time Carolyn Arnold saw Oswald on the second floor (p.168; Rowland: Warren Commission Hearings , vol.2, pp.171–3). Finally, the film expertly dramatises the implausibility of the claim that Lee Oswald (played by Gary Oldman) had managed to cross the sixth floor, hide his rifle, and dash down the wooden stairs, unnoticed by several colleagues, before being seen inside the second–floor canteen, no more than a minute and a half after the final shot, by Marrion Baker and Roy Truly (played by Bill Pickle and Johnny Brink, respectively; pp.168f). and the evidence of Harold Norman and James ‘Junior’ Jarman, who indirectly attested to Oswald’s presence on the first floor five or ten minutes before the shooting (see Lee Harvey Oswald’s Alibi). and the location of his head wound. Jean Hill (played by Ellen McElduff; pp.122ff). Richard Dodd’s words are taken from his interview for Mark Lane’s documentary film, Rush to Judgment . Dodd was one of many witnesses whose experience of the JFK assassination was for some reason not fully reflected in his official statements. Jean Hill’s earliest official statement does not mention the origin of the shots. She does describe this in a later official interview and then in her Warren Commission testimony, on which her words in JFK are based. Over the years, Jean Hill’s account acquired several conspiratorial embellishments, some of which were dramatised in the film (see Are There Factual Errors in Oliver Stone’s JFK ?). Although her earliest statements are credible, there were dozens of more trustworthy grassy knoll witnesses who could have been used in the film. The throat wound is dealt with in just one sentence: “Not one of the civilian doctors who examined the president at Parkland Hospital regarded his throat wound as anything but a wound of entry” (p.156). The sentence is literally true, but slightly misleading; most of those doctors had not actually seen the wound before Dr Malcolm Perry performed a tracheotomy over it. The doctors who had seen the wound in its original condition did indeed believe that it had been caused by a bullet fired from in front. In a press conference at Parkland Hospital just over one hour after President Kennedy had been pronouced dead, Dr Perry stated three times that the throat wound was one of entrance, not exit. The press conference was widely reported, and played a part in generating the earliest JFK assassination conspiracy theories. During Dr Perry’s Warren Commission testimony, Arlen Specter rather shamefully persuaded the obliging doctor to agree with Specter’s proposition that the newspaper accounts of the press conference were incorrect, and that the throat wound may instead have been caused by the bullet that hit President Kennedy in the back. The transcript of the Parkland Hospital press conference came to light some time later, and demonstrated that Dr Perry had in fact been adamant that the shot that caused President Kennedy’s throat wound had been fired from the front. Two of the doctors who had treated President Kennedy at Parkland Hospital are shown testifying that the large wound to the president’s head extended into the occipital area, toward the rear of the head, which implies a shot from the front (pp.155f). The medical evidence in the JFK assassination is complex and contradictory, but it is undeniable that many of the medically qualified people who saw the head wound described it in the way it is described in the film. One of the most difficult problems for the Warren Commission and its later supporters was to provide a plausible explanation of exactly how the hypothetical lone gunman could have committed the crime in the limited amount of time available, while firing from an awkward position and using a rifle that was in such a bad condition that it could not be aimed accurately. The man who was required to be that lone gunman was officially “a rather poor shot” when tested while in the Marines in 1959. There is no credible evidence that Oswald ever practised with a rifle during the four years before the assassination. You try to hit a moving target at 88 yards through heavy foliage with this cheap 13–dollar sucker, the world’s worst shoulder weapon. No way. The FBI tried two sets of tests and not one of their sharpshooters could match Oswald’s performance. Not one. And Oswald was at best a medium shot. The scope was defective on it, too. I mean, this is the whole essence of the case to me. The guy couldn’t do the shooting. Nobody could. The “heavy foliage” had in fact obscured the view from the sixth–floor window only for the first few seconds of the car’s journey down Elm Street; there would have been a clear view when the car was 88 yards away, at the instant of the fatal shot. The official case acknowledged that the first shot could not plausibly have been fired while the car was hidden behind the tree. The time frame of 5.6 seconds established by the Zapruder film left no possibility of a fourth shot from Oswald’s rifle, but the shot or fragment that left a superficial wound on Tague’s cheek had to come from a bullet that missed the car entirely. Now we have two bullets that hit, and we know one of them was the fatal head shot. So a single bullet remained to account for all seven wounds to Kennedy and Connally. The magic bullet enters the president’s back, headed downward at an angle of 17 degrees. It then moves upward in order to leave Kennedy’s body from the front of his neck — his neck wound number two — where it waits 1.6 seconds, turns right and continues into Connally’s body at the rear of his right armpit — wound number three. Then, the bullet heads downward at an angle of 27 degrees, shattering Connally’s fifth rib and leaving from the right side of his chest — wounds four and five. The bullet continues downward and enters Connally’s right wrist — wound number six — shattering the radius bone. It then enters his left thigh — wound number seven — from which it later falls out and is found in almost pristine condition on a stretcher in a corridor of Parkland Hospital. and Connally’s earliest apparent reaction to a shot, which occurs at about frame 238. Zapruder’s camera ran at approximately 18 frames per second; 28 frames equates to just under 1.6 seconds. Based on frame Z224, Kennedy must have been struck at least 200 milliseconds prior to this frame, because the movement of his hands to his throat is apparent. This period of time corresponds to about three and a half Zapruder film frames, since his camera ran at 18.3 frames per second. This means that Kennedy must have been struck by frame Z221, or before. In the period of these three frames, a bullet from a Mannlicher–Carcano would travel about 400 feet. The distance between Kennedy and Connally was about only 3 feet. The courtroom scene includes a diagram that exaggerates the twisting course of the bullet. Garrison’s words, “turns right”, may not be justified. It can be argued that President Kennedy and Governor Connally may have been aligned horizontally in such a way that a bullet fired from the south–eastern corner of the Texas School Book Depository could have passed through both men without needing to veer left or right. The photographic evidence does not allow the horizontal alignment of Kennedy and Connally to be accurately determined. What is beyond dispute is the vertical alignment that disproves the single–bullet theory. Kennedy’s back wound was too low for a bullet fired from the sixth floor, sixty feet (18 metres) above the road, to have come out of his throat, as the theory required, and then to have gone on to hit Connally, as the theory also required. Looking at the scene from directly above, it is possible, though far from certain, that Kennedy’s and Connally’s wounds were lined up with the sniper’s nest. Looking at the scene from the side, it is obvious that Kennedy’s and Connally’s wounds were not lined up with the sniper’s nest. Firstly, Kennedy’s back wound was lower than his throat wound. Secondly, although the wounds in Connally’s back and chest were consistent with a shot from behind and above, they could not have been caused by a bullet rising out of Kennedy’s throat. What turns the single–bullet theory into the magic bullet theory is not just the bullet’s elaborate trajectory, but the fact that Commission Exhibit 399, the bullet that had apparently been found on a stretcher at the hospital, had sustained hardly any damage. The film mentions the Edgewood Arsenal ballistics tests, which showed that the bullet or bullets which broke Connally’s rib and wrist almost certainly would have sustained substantial damage (p.153). It did not become widely known until after the release of Oliver Stone’s JFK that the CE 399 bullet had been placed into evidence fraudulently, and was not the bullet that had been found on the stretcher. For details, see Gary Aguilar and Josiah Thompson, ‘The Magic Bullet: Even More Magical Than We Knew’ at history–matters.com. “I put together a list of all the CIA files on Oswald that were part of the Warren Report and asked for them. … Oswald in the USSR, in Mexico City, Oswald and the U2, a CIA 201 personnel file, a memo from the Director on Oswald, travel and activities — can’t get one of them. All classified as secret on the grounds of national security” (p.45; emphasis in the original). “He learns Russian, he acts overtly Marxist with two other Marines, but he’s stationed at a top–secret base in Japan where U2 spy flights over Russia originate. He’s discharged from the Marines supposedly because his mother’s sick. He stays home three days, then with a $1500 ticket from a $203 bank account, he goes to Moscow” (p.46). “From 1945 to ’59 only two US soldiers defect to Russia. From ’59 to ’60, seven defect, six return, one of them another Marine a month before Oswald. All of them young men made to seem poor, disenchanted” (p.49). “The State Department issues him a new passport in 48 hours and loans him the money to travel [back to the USA]. He’s never investigated or charged by the Navy for revealing classified information, or, as far as we know, debriefed by the CIA” (p.50). “Equally incongruous is Oswald becoming chummy with the White Russian community of Dallas — all rabid anti–Communists” (p.52; emphasis in the original). “The only Russian that suspects Oswald of still being a Communist is Anna Meller. But her Russian friend tells her ‘he’s checked’ with the local FBI and was told Oswald is all right” (p.54; see Warren Commission Hearings , vol.8 p.383). If he had played a part in the assassination, he may have been obeying orders. If he had not played a part in the assassination, he may have been manipulated into becoming the patsy that he claimed to be. For evidence that Oswald was in fact manipulated, see “A Little Incident in Mexico City”. The film describes and dramatises Silvia Odio’s encounter with ‘León Oswald’ in Dallas at the end of September 1963, along with two other instances in which credible witnesses claimed that Oswald, or someone impersonating him, drew attention to himself before the assassination: taking a car for a test drive, and making a nuisance of himself at a firing range (pp.73f). The film dramatises the most important element of the Odio incident: the phone call to Silvia Odio in which Oswald is specifically associated with the assassination of President Kennedy. The impersonation of Oswald in Mexico City, however, is treated inadequately, largely because the most important evidence was withheld from the public until after JFK was released. The film shows the photograph of the man whom the CIA’s Mexico City office claimed to have been Oswald, but gives the photograph no significance other than Garrison’s statement that “they [the Warren Commission] got almost 150 pages and 130 exhibits of the report on this Mexico trip and the picture doesn’t even match” (p.74). I’m beginning to think the point of the Mexican episode was to lay the blame at Castro’s door. If Oswald, or someone purporting to be Oswald, had gotten into Cuba, come back, then killed the president, the American public once again would’ve screamed for a Cuban invasion. One of the purposes of the impersonation may have been to provoke an invasion of Cuba, which did not happen. A more credible purpose may have been the impersonation’s actual effect: to provoke the official cover–up of the assassination. It is conclusive evidence that Oswald was being framed before the assassination. Unlike the other instances of impersonation, which relied on the testimony of possibly fallible eye–witnesses, the existence of the impostor in Mexico City was documented in photographs and tape recordings, and was acknowledged by senior Washington officials such as J. Edgar Hoover (see Johnson to Hoover, White House Telephone Transcripts, 23 November 1963, LBJ Library, Austin, Texas). Either Oswald or the impostor had met a Soviet official whom the CIA suspected of being part of the KGB’s assassinations department. This prima facie evidence of Soviet involvement in the assassination played a decisive role in provoking the official adoption of the politically harmless lone–nut explanation. The López Report , which covered the Mexico City incident in detail for the House Select Committee on Assassinations in the late 1970s, was only made available to the public after JFK was released. Indeed, it was largely due to the film that the report was made available at all. Parts of the document, notably “another section of this final report dealing with whether or not Lee Oswald was an agent or asset of the Central Intelligence Agency” ( López Report , p.142), are still withheld. Cap’n, I know you’re working like a hound dog down there to get this mess wrapped up, but I gotta tell you there’s too much confusion coming out of Dallas now. The TVs and the papers are full of rumor ’bout conspiracies. Two gunmen, two rifles, the Russkies done it, the Cubans done it …. This thing could lead us into a war that could cost 40 million lives. We got to show ’em we got this thing under control. No question, no doubts, for the good of our country … you hear me? Cap’n, you got your man, the investigation’s over. That’s what people want to hear. and the way in which Johnson used the prospect of a nuclear war to persuade Earl Warren, and perhaps others, to serve on what was to become the Warren Commission. The film contains an earlier reference to the possibility that the Cuban connection might lead to war. An FBI agent persuades ‘Bill Broussard’ (played by Michael Rooker) to betray Garrison: “Look, we know Oswald didn’t pull that trigger. Castro did. But if that comes out, there’s gonna be a war, boy — millions of people are gonna die” (p.105). It is debatable whether the threat of nuclear war was utilised this far down the chain of command, but it is certain that President Johnson made use of what he called “a little incident in Mexico City” to ensure that the lone–gunman hypothesis became the official explanation of the JFK assassination. Are There Factual Errors in Oliver Stone’s Movie, JFK ?